As a child, I was obsessed with comic strips. I spent years filling spiral bound notebooks with fan fiction and rip-off strips of my own design, sprinkled throughout with drastic, emotional diary entries. I never got into comic books or super heroes, but I loved goofy, highly-stylized caricatures, political cartoons, and any form of a panel-based gag. I even indulged regularly in the eye-rolling puns of Garfield. 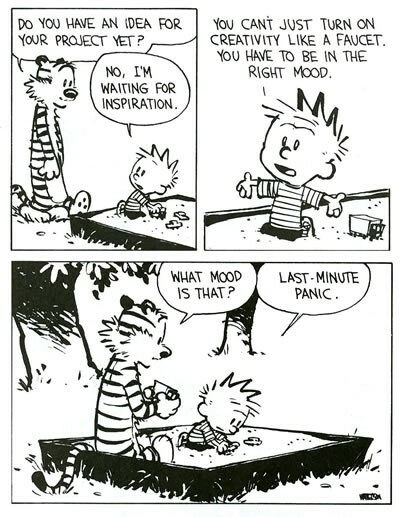 Calvin and Hobbes was (and still is) more breath-taking and thought provoking with every reading, not to mention a great vocabulary expanding tool. Along side The Far Side, Baby Blues, Zits, Tintin, Family Circus, and many others of my preteen world were Charlie Brown, Snoopy, and Charles M. Schultz. The death of Charles Schultz was perhaps the first celebrity death I can recall impacting me. Schultz was the first person I ever researched and studied biographically from purely personal interest. I’m not a die-hard Peanuts fan to be perfectly honest. I prefer a good simple twist in the third panel, and most of Schultz work stuck to self-deprecation or anxious social commentary in a way that most artists in the field had long abandoned. I loved him more for what he was than for attachment to his work. He was the last standing giant from an age of world-renown innovators in the field. It was interesting then to read the following in Daily Rituals concerning Schultz. As I mentioned concerning Samuel Beckett, it continues to impress me that great art comes not from overcoming our troubles and idiosyncrasies or ignoring them, but from exploring what they actually mean about us.